Shopping for Hobbit / Lord of the Rings Games? Gather your courage and strength as you journey into the darkness to build your empire in the land of good and evil! 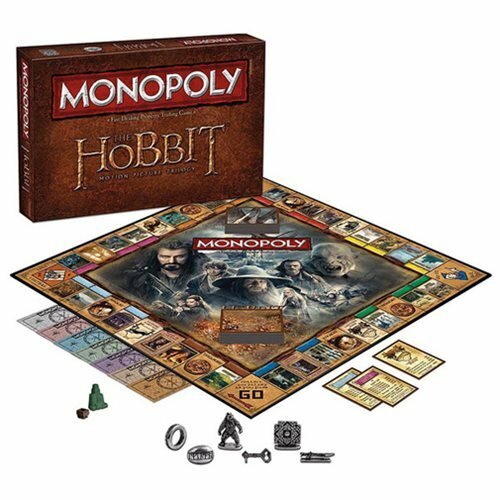 The Hobbit Trilogy Edition Monopoly Game allows you to buy, sell, and trade strategic territories throughout Middle-earth as featured throughout the epic fantasy-adventure film trilogy The Hobbit: An Unexpected Journey, The Hobbit: The Desolation of Smaug, and The Hobbit: There and Back Again. 2 to 6 players. Ages 8 and up.